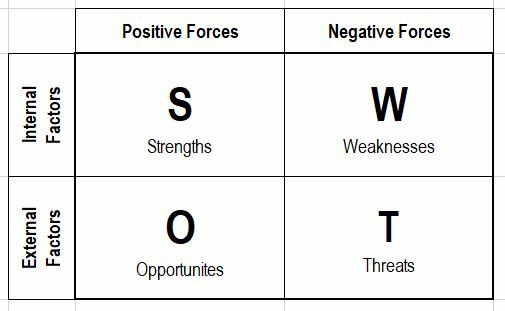 SWOT Analysis and Camping (yup, both) – GoRocco.Pro – Coaching for Leaders, Founders, and Owners. The leaves are almost all gone here, and the chill of early winter has settled on us. Two weekends ago I took my youngest daughter for a late-season camping trip, and we awoke to snow! It was a fun mini-adventure that we shared. We knew the threat of snow, so we planned for it. What we didn’t know, was that at 2:00 am we would need to crawl in the same sleeping bag to keep warm. Awakening to a blanket of snow exposed a weakness that all mammals share, which is the need to keep warm. We adapted to the cold by wearing warm clothes and using sleeping bags as a means to mitigate the threat of cold. Cuddling up got us through the night, but seeing the snow covering our campsite, raised another warning-flag. We planned to cook a big camp breakfast with bacon and eggs, coffee and cocoa, but the reality of the snow made us rethink our plan. We were sleeping in the truck camper, so we got the engine running to warm up the cab, and I moved my littlest one up front to keep her warm while I packed up our stuff, and we headed to a restaurant for breakfast. She lit up with happiness, and we spent the next little while tossing rocks and trying to make the biggest splash possible. This story highlights the value of planning for fun stuff like camping, but we can analyze ANY venture, whether it’s a business, career, or personal aim. More importantly, the story is intended to demonstrate how we must always adapt to negative external factors (like snow fall while camping) but also positive ones (like an empty beach where rock-chucking is encouraged!) 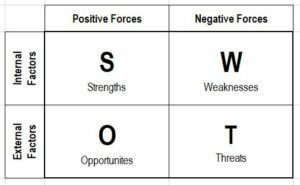 You can use the method of a SWOT analysis (Strengths, Weaknesses, Opportunities, and Threats) both in terms of a fun camping trip turned cold, and as a business exercise. If you’re like me you see things better with an example. Here’s one of a company that I co-founded, so you can see how we apply this analysis in practice. Description: GreenFocus was formed through a merger between two strategic US companies with a passion for technology and for people: GreenFoot Technologies and PowerFocus Engineering. This organization has a vision to improve Filipino’s lives by introducing unlimited pure water and affordable energy in areas where they are not readily available. · Exclusive distribution rights for water and energy generation for the Philippines. · Successful franchise model for distributing those products leveraging successful, local, vested stakeholders. · Strong brand and relationships with major public and private industry players. · “Test before we sell” method leveraging internal product testing and development core competencies. · Strong differentiated product offerings meeting a growing need. · Good marketing skills (B2B, P2P, B2G) conforming to local norms. · Initial product offerings, which must carry the company for 12-18 months, are purely reselling, putting the company fully at the risk of suppliers’ performance. · Initial products target the A-B market segment only, which although is a strong segment representing the majority of the national buying power, misses the people most in need of water. · Low funding risks the first mover advantage and ability to scale. · Insufficient staff and internal expertise for handling the volume of international trade work required. · Lack of material and inventory management tools and internal expertise. · Executives over-committed and forced to take a major role in day-to-day operations, diluting the focus and immediate growth opportunities. · Future product offerings will strongly leverage gov’t and local major water and energy players to reach the C-E demographics. · Strong market demand and proven competitive price point, well positioned amongst competitors. · Perceived higher quality of US goods and services. · Strong tax breaks available both as recognition of capital investment (BOI – Phil) and to encourage the export of US products (US-DISC). · Additional untapped resources in R&D and HR will dramatically accelerate the new product development process and will benefit from the “boots on the ground” distributors for market intel, beta tests, and a conduit for rapid sales blanketing all levels of the market. · Barriers to foreign business penetration overcome through franchise model. · Financial vehicles for micro-loan financing, BOT funding partners, will not only provide additional options for customers to purchase, but additional profits through those financial vehicles. · Political risks / change to government support for foreign corporations could dramatically affect business performance. · Competitors from India, China, Singapore, and Korea are beginning to make inroads into the market. · Taxation implications of moving revenues from royalties and franchise fees internationally. · Logistics and fuel costs fluctuations. I hope that you enjoyed the story and found value in the exercise. Please let me know if you have any questions. Want to fillable PDF SWOT Template that you can use yourself? ← What counts as ‘work’?